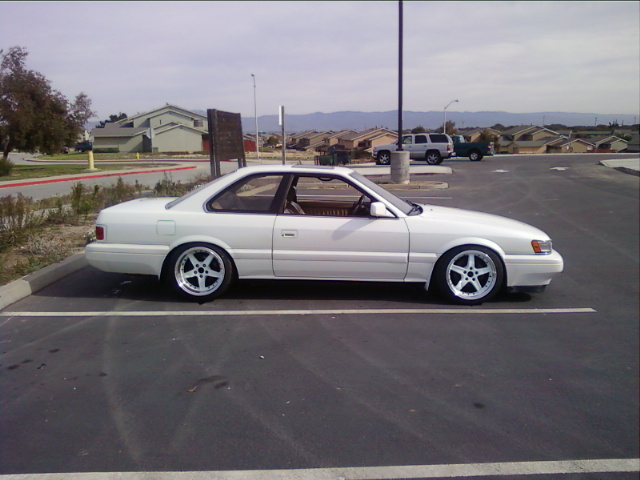 Forums » Grassroots Motorsports » Sleeper? Try Coma. Or considering this is a LSx swapped Toyota, it may be into out-of-body experience. Did they really have to bash the Cressida so much? They were pretty cool cars, in a grandfatherly sort of way. What I like about it is that it's pretty much invisible. Everyone's looking around for the Camaro, and there's a Cressida sitting there. I don't think they bashed it enough. Some cars have aged well. I wouldn't put the Cressida on that list. Too noisy. That thing needs an army of mufflers. True sleeper status when it calmly walks away from sports cars without any racket. 92CelicaHalfTrac wrote: Needs moar 2jz. Never thought I'd see the day I considered LS swaps played out*, but here we are. I'd rather have this engine in a cressida: http://www.youtube.com/watch?v=Y9wllnOktS4 I don't even care that the LS would be faster. E: Seriously, something like this with a 1UZ and I'd drive it every day. Greatest sleeper of all time? No. I'd say this one's closer to those honors. Zomby woof wrote: I don't think they bashed it enough. Some cars have aged well. I wouldn't put the Cressida on that list. I have spent far too much time in cressidas to appreciate them. It is one of those familiarity breeds contempt things.....contempt for vast quantities of velour among other things. I knew a guy with a beat-looking 4-door '69 or '70 Cutlass that looked about like that, peeling vinyl top and all. He wasn't making over 1000 hp, though - just a well-built 455 under the hood making plenty of good old natural power. The lumpy cam made it idle like it was only hitting on 7, and he had rigged a foot pump from an old Opel windshield washer to squirt oil into the muffler on one side of the duals so it smoked a bit on command. Looked like the wrath of Bob until he launched it, but then it went like stink. I LOVE THIS. If you don't like this, I'm thinking you simply don't like cars. 40 years ago there used to be street racing on Carling Avenue in Ottawa. They raced light to light for money,or pink slips. One guy showed up one Saturday night in a pretty beat looking Studebaker Lark, powered by a built up 427 Chevy BB. THAT was a sleeper. while i LOVE that nova, anybody who didn't see that one coming isn't a car guy in the first place. when i think of a real honest Q-Ship it can't just be old or beatup or both. it's gotta be like an '85 Celebrity or something. a car your brain doesn't want to believe even could be fast. belteshazzar wrote: while i LOVE that nova, anybody who didn't see that one coming isn't a car guy in the first place. when i think of a real honest Q-Ship it can't just be old or beatup or both. it's gotta be like an '85 Celebrity or something. a car your brain doesn't want to believe even could be fast. And I like the cressida regardless of what is overpowering it. If you want a coupe with similar proportions I just saw one of these guys pop up locally. now add a late(r) model L67 drivetrain with all your favorite mods, and run the quarter 5 or 6 seconds faster than anyone at the starting line expected. 929 wouldn't take much..... MPV manual trans swap, a snail or two, let the hilarity begin! Bonus points for a DOHC JE-ZE powered variant. Nitroracer wrote: And I like the cressida regardless of what is overpowering it. If you want a coupe with similar proportions I just saw one of these guys pop up locally. What is this? Looks like an M30, but stretched... or is that just the picture? Just a standard M30 as far as I know.